Originally published under the title "Excuse Me, Your Cognitive Dissonance Is Showing." On June 5 in Brighton, Melbourne [Australia], at a spot I have driven past countless times, there was a terrorist incident. An armed Muslim, Yacqub Khayre, crying out support for the Islamic State and Al-Qaeda, took a hostage, killed a hotel worker, and engaged police in a shootout, until he was shot dead. It is hard to imagine a less likely place for jihadist violence than affluent, Anglo Brighton, with its tidily quiet tree-lined streets of multi-million dollar homes. If it could happen in Brighton, it could happen anywhere. Islamic terrorism has been a shock to the secular soul of the West. We have tried to address the security challenge, but are not across the intellectual challenge. Recently in the Australian, Jonathan Cole exploded three myths that hamper efforts to counter terrorism: the essentialist claim that Islam is a religion of peace; the idea that jihadists are political actors exploiting religion; and the idea that jihadists are deranged psychopaths. In response, Cole argued that the terrorism debate needs to engage with Islamic theology. There is a fourth myth not canvassed by Cole, the "myth of the extremist." This is the idea that the jihadist's condition is a case of "extremism," a state which transcends any particular religion, and which therefore has nothing particular to do with Islam. The myth is that the problem is not what jihadists believe, but the way they believe; not the content of their faith, but the blindness with which they pursue it. This was the view of Charles Wooley's recent article "Blind faith breeds barbarity in Islam as it did in Christianity." The myth is that the problem is not what jihadists believe, but the way they believe. Warnings against taking things to extremes are as old as Aristotle. In modern times, the idea of the extremist was popularised in The True Believer by Eric Hoffer, who claimed that mass movements are interchangeable, so an 'extremist' is just as likely to become a communist or a fascist. Hillary Clinton has been an advocate of the view that extremism is the problem behind terrorism. She has argued, without a trace of irony, that the primary challenge to religious freedom in the world comes from people who believe in their faith to the exclusion of all others, and identified religious certainty as the root of intolerance and terrorism. Bertrand Russell called upon rational people everywhere to "Conquer the world by intelligence, and not merely by being slavishly subdued by the terror that comes from it." 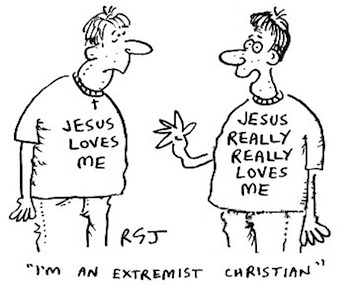 No doubt some disbelievers look at religious belief through the prism of the "extremist" myth because they assume religions are driven by emotional needs, especially fear, and as such they are not amenable to rational analysis. However, now that we are indeed being assailed on every side by "terror from the world," it is ironic that a dismissive attitude to religion helps sustain the great Cloud of Unknowing currently surrounding Islamic terror. Self-styled jihadists perform the vast majority of terrorist attacks in the world today. The extent of the problem becomes apparent in the cognitive dissonance of advocates for the myth of the extremist. Proponents of the myth of the extremist suffer cognitive dissonance from the fact that self-styled jihadists perform the vast majority of terrorist attacks in the world today. The Religion of Peace website has documented 30,986 Islamic terrorist attacks in the world since 9/11. If the problem is not Islam, but extremism, where have all the non-Muslim extremists gone? The theory of cognitive dissonance proposes that people may go to considerable lengths to minimise the mental discomfort of holding beliefs inconsistent with reality. A famous example, documented in When Prophecy Fails (1956), was a Chicago cult, which believed that an alien spacecraft would land on the earth to rescue cult members from corruption. After the alien landing failed to materialise on the prophesied day and time, the cult countered with increased fervency and proselytism. One of the means of countering cognitive dissonance is misperception, the misrepresentation of reality to satisfy the inner need for coherence. The greater the cognitive dissonance, the more grotesque the misperceptions become. How do advocates for the myth of terror as extremism respond to the challenge of overwhelming contrary evidence? One tactic is to look back centuries for examples of Christian intolerance. Don't forget the Crusades! Another is to scout around for contemporary examples of terror in the name of any religion but Islam. Hillary Clinton's example of present-day Christian extremism was The (Irish)Troubles: "We watched for many years the conflict in Northern Ireland against Catholics on the one side, Protestants on the other.' Charles Wooley went the same route: 'I remember Christians indiscriminately blowing up innocent civilians during the so-called Troubles in Northern Ireland. They believed God was on their side, so any atrocity was justified." Clinton and Wooley's cognitive dissonance shows in their blatant misperception. Although the Catholic-Protestant divide was the shibboleth for the Irish, in fact the conflict was not driven by religious belief. In the IRA's Green Book, a handbook for armed resistance against British occupation, there is not a single mention of God, Jesus, the Bible, Catholics, Protestants or even religion. Instead, the crystal-clear goal was to end British occupation, and "create a Socialist Republic." For this the IRA looked for guidance to Marx, not Christ. In complete contrast to the IRA's Green Book, materials put out by Islamic terrorists are invariably jam-packed with religious references. We must jettison our comforting cognitive short-circuit devices and start taking Islamic theology seriously. Charles Wooley's misrepresentation is all the more striking because he holds an honours degree in history, and has half a century of experience as a journalist under his belt. By now he ought to know fact from fiction. Wooley's citing of The Troubles was a misperception motivated by the need to minimise cognitive dissonance. Fifty years of training and experience did not prevent him from misperceiving the Northern Irish political struggle as religious, because the myth of the extremist needed it to be so. We live in an era where myths abound, many of which are failing in the face of radical Islamic violence. The sooner we jettison our comforting cognitive short-circuit devices and get on with the rational task of taking Islamic theology seriously, the better.